If you're currently living somewhere snowy (especially you, northeastern United States...stay safe), you might be having a difficult day thanks to weather-related logistics. Namely, how crazy it is trying to navigate large amounts of snow when they suddenly appear in your roads and driveways. Japan (of course) has invented a strange but useful vehicle to handle this problem in an efficient manner. 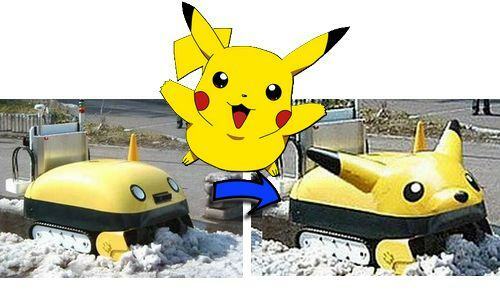 According to inventorspot.com, the Yuki-taro robot uses GPS and cameras to self-navigate as a cute little snowplow. Designed to help Japan's elderly so that they don't become shut-ins during snowstorms, Yuki-taro is currently a prototype that will eventually be sold for some 1 million yen ($9000) apiece to aid municipalities. This is the future. Don't laugh, Yuki-taro will neatly stack snow even after nuclear winter. The self-guided snowplowing isn't the best part, though. Yuki-taro, um, "creates" bricks of snow as it works, allowing for neatly piled excretions to be used for homemade igloos or stashable summer cooling elements. Yes, Yuki-taro basically rolls around town looking cute and pooping out snow-bricks. Your snowfort will have some serious architectural support with Yuki-taro around. And yes, since it's Japan, they might even make them look like Pokemon or Hello Kitty. Next up: Cthulu-tentacled lawn sprinkler? Well, at least you don't have to shovel.